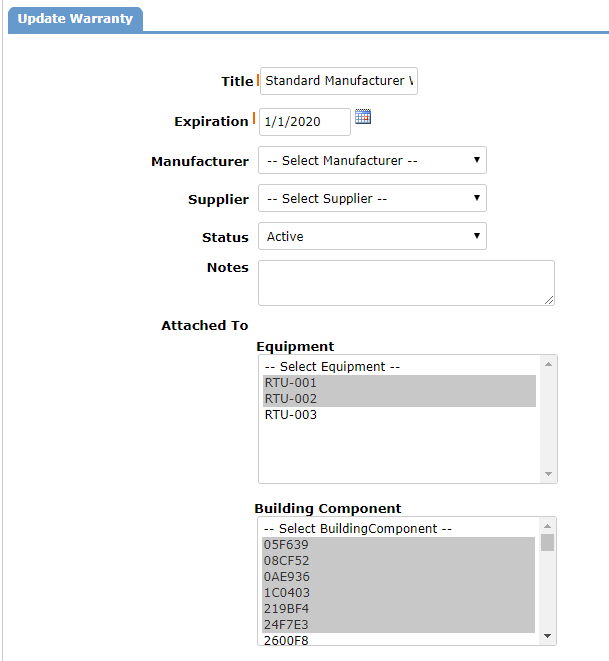 In Capital Forecast, you can easily keep track of your building component or equipment warranties. If a warranty contains an attachment, the attachment will appear on any needs tied to the equipment and building components the warranty is associated with. Click the Warranties link found under the Information & Analysis section of your home page. Enter a Title for the warranty. Click the calendar icon and choose the warranty Expiration date. If the warranty is specific to a Manufacturer or Supplier, select the appropriate option in these fields. The Status field will automatically populate based on the Expiration date that was entered. Enter any Notes if necessary. Select the Equipment and/or Building Components this warranty should be attached to. A Warranty can be attached to as many pieces of equipment and building components as needed. To select multiple items, hold the Ctrl key on your keyboard while making your selections. If you would like to add any additional documentation to the Warranty, click the Add New Attachment link. In the Attach File window, choose whether you would like to attach a File or a Link from the web. If you selected to attach a file, click the Choose File button to select the file from your computer. *Note: The size limit for attachments is 5MB. If you selected to attach a link, enter the URL. Click Save to add the file attachment to the Warranty. Once the attachment has been added to the Warranty, you can edit the file by clicking the pencil icon ( ) or delete the file by clicking the delete icon ( ).